Please note that once you have selected the appropriate category/categories, you should also consider the Guidelines which should form the basis of all category entries. The Arts and Cultural Sponsorship category is focused on the traditional arts and culture community; for example - museums, galleries, classical music, opera, theatre. Look for culture-commerce connectivity. For the 2018 edition, this category was divided into Events & Awards and Theatres, Museums & Galleries. This category is focused on the contemporary music, festival and event sectors (can be any type of live event whether cultural or sport or neither). It recognises the fact that sponsoring the Mobo Awards, Glastonbury or a Concert Tour is different to sponsoring The National Theatre or V&A. If you're not sure, please do call us to talk it through. This category, formerly known as Charity & Community Engagement Sponsorship, is designed to reward social purpose campaigns which benefit both the sponsor and the sponsored organisation. Try to make this very clear in your entry. This category is not restricted to schools or core curriculum. School-based sponsorships are still welcome, but campaigns which achieve broader learning goals are also encouraged. This might mean FE and HE but could also be sponsorships based around re-skilling or adult education. We're looking for sponsorships with a green ethos running through them. This category is open to sponsorships of 'green' organisations or campaigns but equally to sponsorships which demonstrate sustainability within their activations. This could be in the context of a new stadium build, stakeholder lobbying, employee activities or cleaning up after a big event such as a festival. This category, which is partnered by Women in Sport, rewards brands, associations and agencies for the work they have done working with and sponsoring women’s projects. This could be anything from opening up access to sport for young girls through to celebrity endorsements that are plugged into the wider female empowerment agenda. As with all categories, the judges will want to see some evidence of clear objectives, interesting execution and positive business results related to the sponsorship. But this will be considered in combination with any evidence supplied about how women or girls have been embraced. In other words, we are looking for a balanced entry, not unlike we do with the Charity & Community Engagement Category. A sponsorship that fails to achieve any business objectives won’t win. But judges will take a slightly less rigorous view on business benefits if they are presented with a truly transformative campaign. Sponsorships of all descriptions are eligible – not just sports. Please contact the UKSA organisers if you are unsure about whether you fit the criteria. The Diversity & Inclusion category is recognition that the UK - like many countries - still has a long way to go in terms of demonstrating true social inclusiveness. Examples of partnerships that might fit this category include sponsorships that support the LGBT community, sponsorships that have increased opportunities for the BAME community in some way, and sponsorships that have addressed the numerous challenges that exist around disability. Echoing the comments made regarding the Women's Activities category, the judges are looking for a combination of business benefits and evidence of social transformation. TV sponsorship is about partnerships that have a stand-alone television property at their heart. The association might be leveraged across other platforms and channels, but the core IP will be a TV show, a channel or a component of a TV show, such as a celebrity/character/show segment. Brands that partner with free-to-air or PayTV properties are the primary but not exclusive target of this category. As an example, 2018’s category winner was giffgaff's sponsorship of Entertainment on E4. To ensure like for like comparisons, this category may be split by size so please specify the fee paid. Branded content and AFPs should be entered in the new Branded Content category – unless they are activations of an overarching TV sponsorship in which case that category may also be relevant. This category is about sponsorships that begin with print, radio or film. It's designed to recognise great work that is often overshadowed by the big budgets available in TV. Again, the sponsorship can (and should) be leveraged across platforms, but it needs to start with Print, Radio or Film IP. This might be a branded supplement or product placement. In the case of film, sponsorships that do not involve product integration into the film itself are also eligible for this category – i.e., a brand may choose to sponsor a period drama film even if it would be anachronistic for it to appear in the production itself. This category covers two key scenarios. Firstly, sponsorships that originate on native digital platforms such as Buzzfeed, Huffington Post or AOL - i.e., not sponsorships that begin in other media such as TV and get carried through to online. Secondly, activations through company-owned websites, platforms and/or channels. The latter group may in some circumstances be stand-alone activations, but are more likely to be activations of larger sponsorship programmes (for example, a gaming platform created on the back of a sports or entertainment sponsorship with the intention of capturing consumer data). This category rewards the most innovative and effective work in online and mobile social media. This can include YouTube but is not about ‘owned media’ such as company or club websites. Whether it’s Facebook, Twitter or some other platform (or maybe a combination of them all), we want to see examples of how social media is transforming the way sponsorship supports branding or corporate objectives. Please provide clear evidence of success, especially around audience engagement levels. This category rewards brands that have made the best use of mobile’s attributes to support their sponsorship. There is an overlap with the social media category – but the winner will be the entry that has placed the unique capabilities of mobile at the heart of its strategy. Aside from mobile-first social media strategies, this category could also cover sponsorships that utilise mobile in areas such as audio, payments, ticketing, video content, VR, AR and gaming. Sponsorships that also take advantage of mobile devices as ubiquitous pieces of hardware that accompany people everywhere could also fit within this category. Tablets are also covered by this category. Best Use of Branded Content is aimed at strategies where the client has been directly involved in the funding and creation of the content in question. It may overlap with TV sponsorship – but it is not the same as sponsoring a traditional TV show or a film. Branded content can be anything from an advertiser-funded show on TV to a piece of content created for the internet. While branded content does not include a standard TV ad, a 3-5 minute film that integrates the brand with more traditional storytelling devices could fall within the definition of branded content. To win this category, entrants must explain why they pursued a branded content strategy and how they activated it across different channels and platforms. Branded content for this category does not need to originate in TV, but can also originate in the online or mobile arenas. In some cases, it can also be a film – such as The Lego Movie – or a game. This category was introduced to recognise the growing importance of brand-talent relationships in business. Any sponsorship that involves a celebrity or influencer as part of its activation strategy is eligible (TV, film, sport, music, etc). Judges will look at why the the personality was chosen (not just because they were famous), how they were involved in the programme and the business benefits they brought. The endorsement must show some evidence of a multi-tiered sponsorship strategy if it is to win. For example, a musician in a TV commercial drinking a brand of beer will not, in itself, be enough to impress judges. Possible scenarios include: Brand A endorses Celebrity X, who then becomes an integrated part of the brand’s marketing activity (getting involved in grass roots activities, hosting online forums, speaking to the press on behalf of the brand, launching product lines, motivating employees, etc.). Or, Brand B sponsors Team Y and secures the services of Celebrity Z as part of its package, and then uses the team and celebrity in harmony. If you are unclear about eligibility, please contact the organisers to discuss. Sports sponsorship isn't all about high-profile activation. Grass roots is a crucial component, so this Award is about the way sponsors and partner organisations reach out to local communities. Echoing the Charity and Community Category, we'd like to see how both the brand and audience benefited. Please indicate on the entry form whether you are entering the Best Football or FIFA World Cup category. As its name suggests, this category is for brands that have made great use of the fast-emerging gaming category. Criteria for success are similar to those in other categories, namely – clear objectives, great execution and proof of business benefits. The fast-emerging field of eSports is covered, but so is sponsorship of everything from high-end console games to casual gaming. Sponsors that have managed to take advantage of emerging technology like VR gaming are also eligible. Open to everything from the London Marathon to large-scale charity events, this category rewards companies that have made effective use of Mass Participation Sponsorship. Clear objectives, innovative activation and great results will be necessary to win this Award. Some indication of why Mass Participation made sense for the sponsor is important. Best Use of Naming Rights is designed to reward companies that have made great use of their assets. While media exposure is a useful benefit of naming rights deals, this category requires some evidence of how the rights in question have been activated in different ways. The scale of the deal is not necessarily a guarantee of success in this category. It is important to show creativity and innovation around assets. Last year's winner was the first direct arena. Rights holders have a wide range of valuable assets including their audience, fan base, membership/season ticket holder databases, broadcast and digital media exposure, branding and activation opportunities, corporate hospitality offerings, facilities, access to ambassadors, community outreach, etc. The purpose of this category is to showcase rights holder organisations across all sectors that have used their assets to maximise their income streams and provide better and more attractive offerings for potential sponsors and partners. Judges will reward organisations that have a clear understanding of the identification and profile of their audiences, who have mined, sliced and diced their databases to ensure that they are sending the most appropriate and effective messages to engage fans with their sponsor partners. The judges will also be looking to see how effectively this has been communicated to the marketplace and that the marketing and sales teams are working together to offer a ‘best fit’ opportunity with optimum activation possibilities for partners. Entry to this Award will not follow the structure of other submissions. The entry should look at sponsorship programme as a whole and use particular campaigns as examples. Anyone seeking more information on the Award should contact us on 020 8891 1067 or email info@sponsorship-awards.co.uk. For guidelines on this category, please click here. To support this category, a UKSA Case File looks at ways rights holders can support/improve their offering. Click here to read more. In this category we are looking for the very best sponsorships which have helped a business organisation or corporate entity reach out to business/public sector/governmental stakeholders businessmen/women and/or high net worth individuals. One important point to note is that we are also interested in how the sponsorship has influenced the company's relationship with its employees (greater loyalty, improved productivity, etc.). So b2b should not just be thought of as the relationship between the sponsor and third party organisations. It is also about internal business benefits. This category is aimed at sponsorships where the primary objective is the promotion of a brand or a group of brands. So we're looking for sales data and brand image shifts. Like sport, this category is split into two budget bands. Please ensure that you state the budget level on the entry form. The winning brand in this category will receive a free one-year license to Community and Sponsorship Management Software PerforMind. Shortlisted brands will receive a free 6-month license. The software allows you to manage all your incoming requests, assess your current portfolio and generate reports. PerforMind helps you carry out the ongoing administration of your sponsorship efforts with enhanced efficiency, clarity and ease. And that frees you to benefit from the new perspective you obtain over your portfolio, one that helps you engage fully in proactive sponsorship or CSR management. As its name suggests, this category is open to campaigns conducted by companies or brands that have executed sponsorship programmes for the first time in the last two years. This category is not open to first time sponsorships but to first time sponsors/brands - i.e., the first time that particular brand has used sponsorship as a marketing vehicle. This category is open to sponsorship campaigns which have been in place for a minimum of four years and have been renewed at least once. Entries are judged on the success of the campaign and how it has been developed year by year. Evidence of how insights have been developed and applied during the course of the relationship is a key consideration. There's no penalty for saying, "X didn't work in year 1, so we did Y in year 2 and boosted sales". A multi-market sponsorship, for brand or corporate entity, which is targeting/ has targeted audiences in three or more countries. Entries should include details regarding : Objectives of research programme; budget level; methods and implementation; quality procedures; integration within sponsorship programme; how research was used to measure success, add value to project, attract new sponsors, etc. Emphasis should be placed on how the research was used to create, develop, edit and revamp the sponsorship. Please click here for full details. 28. Best Use of Public Relations in a Sponsorship Campaign – supported by the Public Relations Consultants Association. This category attracts two kinds of entries: PR stunts or PR as a piece of integrated strategy. Both can win and have won. But we are more interested in well-thought strategies than a stroke of luck. If stunt-based, try to show us how the stunt came about and how you managed to leverage the impact it generated, not just the number of column inches and bulletin mentions it achieved. Another category designed to recognise the great work being done with a smaller budget. Usual criteria apply but we are conscious of the fact that less budget limits what can be done in activation. This category will be split into segments by size of agency, and possibly by type. It is essential therefore that you provide information on fee income. In previous years, this has meant one for large agencies (likely to have turnovers of £5 million plus) and another for Medium to Small or boutique consultancies. In 2017, we also gave an award for Innovation and in 2019 we will also be looking for the Best Breakthrough Agency. Entries are encouraged from both the sponsorship sales and the advisory and activation sides of the business as we will be awarding a prize to the best sales team. However the final decision as to which category an agency falls into will be down to the judges. Judges will receive all entries in one group and then filter them into sub-groups, awarding a winner in each. Their decision is final. This approach is to make sure we are measuring like with like and not unfairly penalising SMEs. No agency should feel it is precluded from entering because of size. Examples of creativity and innovation either in terms of sponsorship campaigns or rights sales strategy. PLEASE NOTE THAT THE ENTRY FORM IS THE SAME FOR ALL CATEGORIES THEREFORE SOME INFORMATION REQUESTED IS NOT RELEVANT TO THIS CATEGORY. PLEASE TYPE N/A IN ALL IRRELEVANT BOXES - I.E., SPONSOR NAME, MISSION STATEMENT, ETC. Entries to this Award are put forward by the judging team during the shortlisting process. The trophy will go to the agency, rights holder or brand behind an eye-catching, game changing innovation. For this category, we will take a slightly softer line on objectives and evidence but will not reward innovation for innovation's sake. The winning campaign will be one which, in the judges' opinion, introduces a creative solution to a campaign’s objectives - something fresh and inventive. It does not need to be a winner in any of the categories. To win the TMT Spotlight Award, entrants will need to meet the same criteria as in other categories: namely proof of clear objectives, examples of innovative and effective activation, and concrete results. The big difference is that the judges will be comparing sponsorships from the same industrial space. As a result they will be able to drill more deeply into the specific nuances associated with this competitive sector. We will be seeking your nominations for a sponsorship(s) which, in your opinion, has been one of most effective, creative, ground-breaking, game-changing, influential sponsorship campaigns of the last 25 years. Nominated campagins will be published on the UKSA website (tba) at which point anyone can vote (once only). The votes will be tallied up on March 1 and a shortlist of five will be announced. The overall winner of the Silver Award will be unveiled at the Awards event. There is no fee for this category but we do need 200-300 words backing up your nomination. Please send to info@sponsorship-awards.co.uk. The top prize will be awarded to one outstanding winner chosen from the winners of the individual categories. This initiative shines a spotlight on some of the most talented and influential figures in the sponsorship and partnership sector. The Champions programme replaces UKSA's long-standing Personality of the Year Award. Champions consists of five awards covering the full gamut of sponsorship activities: Arts & Entertainment, Sport, Community, Media and Innovation. All we need is your recommendation with a couple of paragraphs outlining why you are nominating this individual sent to info@sponsorship-awards.co.uk. This award recognises young executives (27 or under) working within agencies, client companies or rights holders who are making a significant impact within their organisation and the sector at large. Judges need a profile outlining what in particular makes this candidate exceptional, how he/she has impacted on your business, exceeded expectations on particular tasks and campaigns and how this translates into future career development. The winner of this category will win a cash prize and will be invited to a career enhancing Think!Sponsorship training workshop. Please send a maximum of 750 words outlining what in particular makes this candidate exceptional, how he/she has impacted on your business, exceeded expectations on particular tasks and campaigns and how this translates into future career development. The submission should ideally come from the executive’s line manager and can include input from clients if appropriate. 1. Why did you put this candidate through for this Award? 2. What qualities stand out as worthy of the BG Award? What does this executive bring to his/her role over and above what can be expected? Please consider: Personality (motivation and drive); adaptability (flexibility of personality); credibility (knowledgeable, confident); innovation (tried new approaches with what results); ambition (drive and desire to succeed). 3. Where do you think he or she will be in five years time? 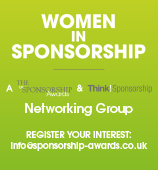 Please email your submission to info@sponsorship-awards.co.uk by the deadline of February 15th 2019. Please do not hesitate to contact us if you need any further information or assistance. A judge will contact you to discuss your candidate in more detail following which conversation the candidate may be invited to join the small judging panel for a quick face to face chat. All finalists will be invited to the Awards Ceremony.